The Palace Hotel was built during the time of the Austro-Hungarian Empire as a tourist facility of the highest category. 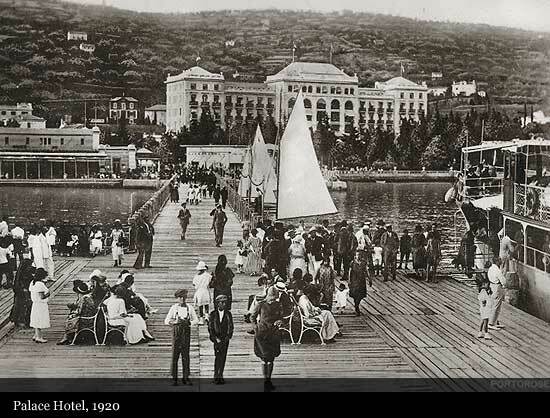 Along with Grado, Venetian Lido and Opatija, Portorož, once known as Portorose - "The Port of Roses", was the most important European seaside resort and health spa. Upon its opening in 1910, the Palace Hotel, after the Excelsior Hotel in Venice, was the most beautiful and the largest hotel on the Adriatic Sea. 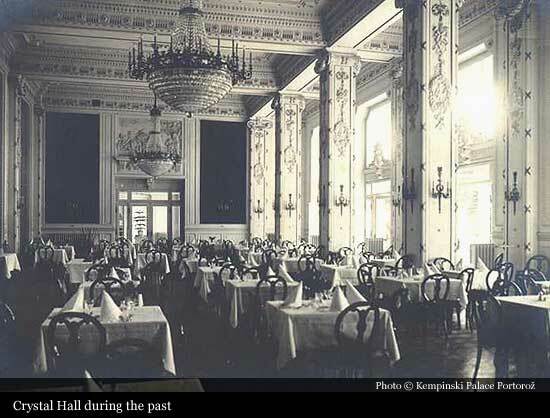 In 1909, the Portorose public limited company started constructing the Palace Hotel, which opened its doors on 20th August 1910 and soon became the most prestigious hotel on the entire eastern Adriatic Sea. 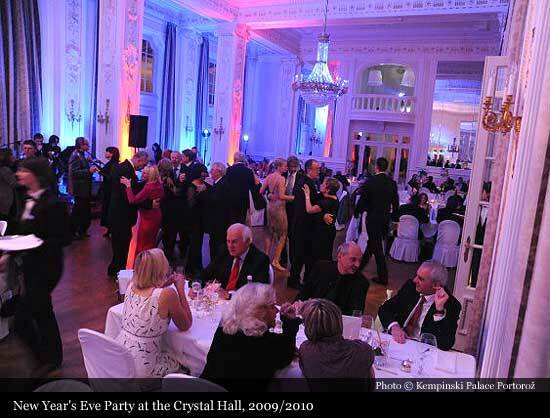 By 1913 it had a record number of guests – 7250, using over 100 rooms. The construction of the Palace changed the image of the Portorož bay forever and outlined its future development. Portorož rapidly expanded from a sparsely populated valley into a modern holiday resort, visited by guests from all over Europe. In the 19th century, there was only a very limited tourism offer for the first visitors. But after the hotel was built, prestigious guests began to arrive in Portorož, since the hotel offered luxurious and comfortable accommodation. 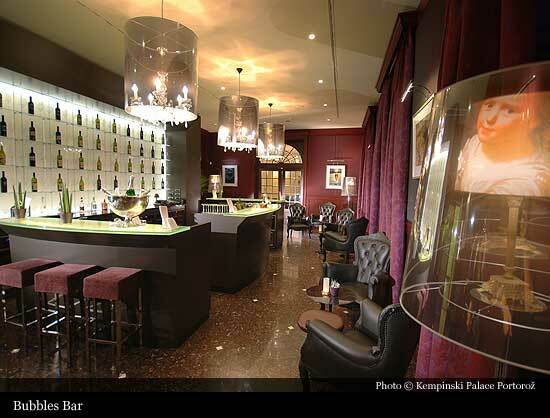 It had a number of luxury salons for socialising and a wonderful restaurant that was unrivalled in the region. The hotel was also well-equipped technically, since it featured luxury suites with private bathrooms, central heating, telephone and electrical installations, plumbing and private lifts. 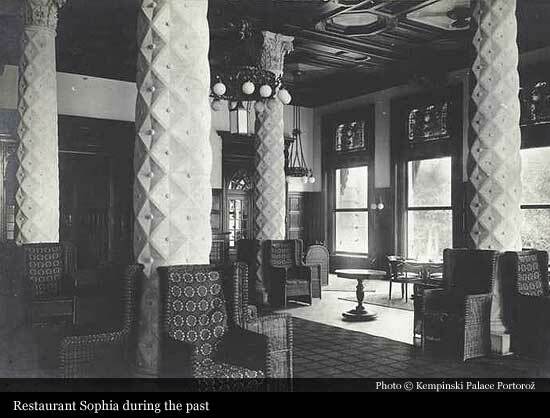 It was undoubtedly the most elegant hotel on the entire Austro-Hungarian Riviera. Palace Hotel shortly after the construction work in 1910 was not only luxury hotel building but it was a symbol of development and success of this area and citizens were proud of it and they identified with it. Portorož with the wider area had a key identity with Palace Hotel. 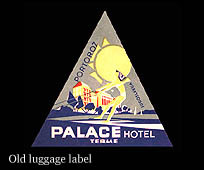 Palace Hotel was not only in the hands of the owners but also in the hands of people who lived with it. Austrian architect Johannes Eustacchio is responsible for the hotels majestic presence, strongly influenced by the other buildings of significance erected during the late rule of the Habsburg Monarchy. Heads of state, movie stars, famous composers regularly appeared in the hotels registry after its opening in 1910. Guests at the old Palace Hotel included, among others: Josip Broz-Tito, the film actors Marcello Mastroianni, Sophia Loren, Yul Brynner, Pierre Brice, and Lex Barker, the American actor and film director Orson Welles, the Croatian pianist Ivo Pogorelic, the Greek composer Mikis Teodorakis, and the popular Italian singers Rita Pavone, Patty Pravo, Mina, Adriano Celentano and Bobby Solo, Bobby Fisher on Chess tournament. Portorož tourism stagnated between the two world wars. 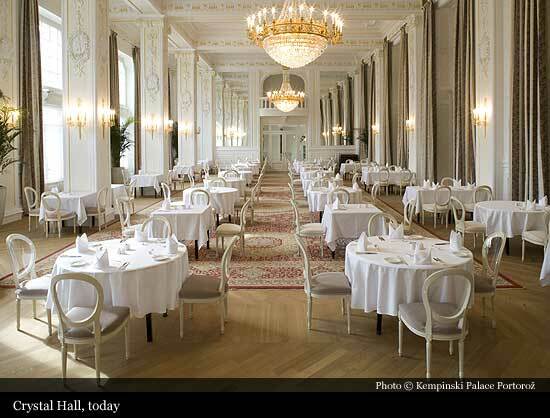 The Palace Hotel was pillaged and was used by German and Yugoslav soldiers. In 1949, its renovation began. Following a two-year renovation period, the Palace Hotel reopened its doors in 1951 and flourished again in its prestige. After World War II the hotel hosted the first Slovenian casino, the Portorož Casino, which operated from 1964 to 1972. The Palace Hotel was closed for the first time in 1980. Three years later some parts of the hotel were proclaimed cultural monuments (the architecture) and man-made landscape monuments (the park). In 1987, the Palace Hotel was closed for the second time; after reopening for a short time, it closed for good in 1990. 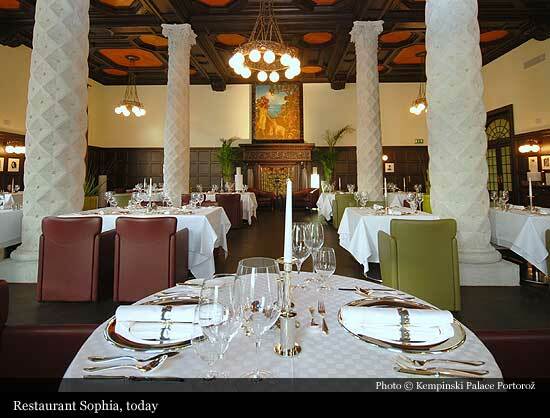 The renovation and extension project, planned by Slovenian architects Sadar+Vuga, was launched on 27th October 2005 and at a cost of about 70 million euros, Palace Hotel reopened in 2008. 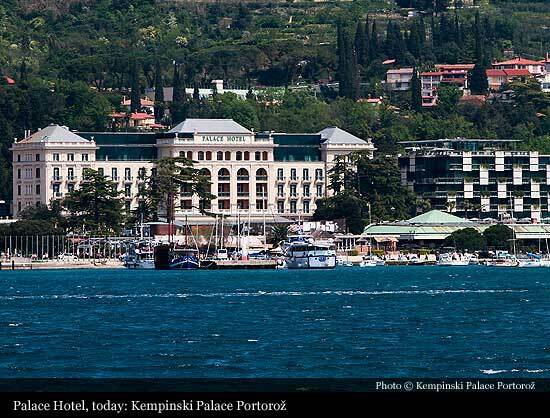 In June 2008, the companies Istrabenz hoteli Portorož and Kempinski Hotels S.A. concluded an agreement under which the Kempinski Hotel Group took over the management of the Palace Hotel for 20 years. 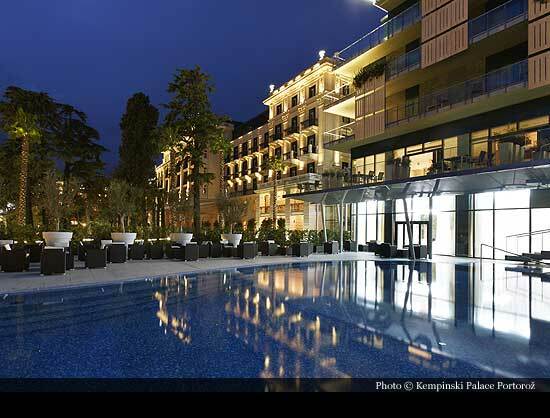 At this occasion, the hotel was renamed Kempinski Palace Portorož. 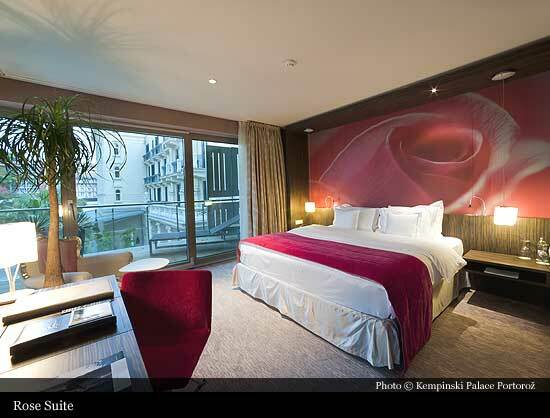 It thus joined the renowned collection of Kempinski luxury hotels. 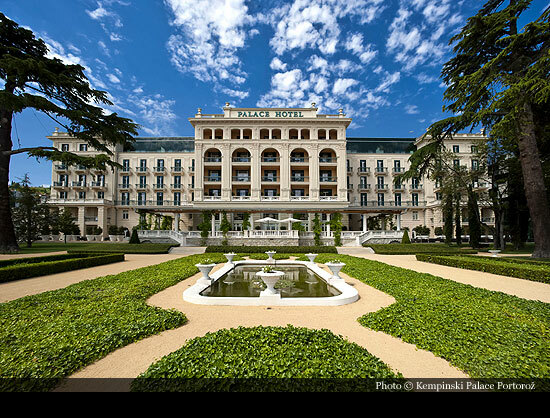 Today, the Kempinski Palace Portoroz is a unique combination of old world charm and state of the art luxury.